Grab your bucket list! Add “Houseboating on St. John’s River” to it. Here’s the Holly Bluff Marina houseboat rental website. Everything you need to know is in the Cruising Guide and Houseboat Handbook and FAQ’s. It helps to have a bit of boating experience, but you are driving a double-wide with a miniature plastic propeller, so everything happens in slow-motion. Next time we’ll go in winter so we can see more manatees, and we’ll rent a canoe so we can really get into the wilderness. The only thing I can’t do is go back in time to when my kids were teenagers: they would have absolutely loved this trip. You can do as much or as little as you want, thrilling and peaceful, but never a dull moment. 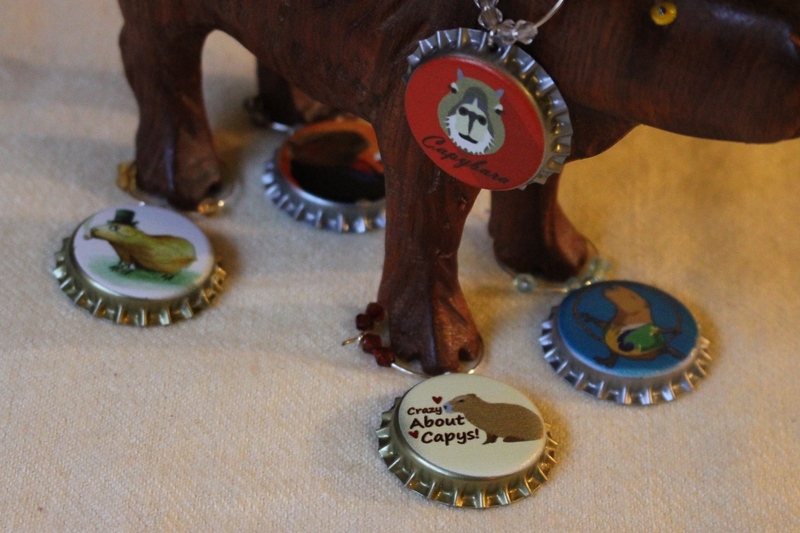 Capycoppy and SuperCapy, driving the houseboat. I’m a fanatic about local cuisine, and our funky hotel was spitting distance from a beachside sports bar serving local draft beer in a ramshackle warren of spaces, over-decorated in my favorite “Put everything in those ten boxes up on the wall. Okay, put some of it on the ceiling, then.” style. We soon got used to seeing gator tail, po-boys, macaroni salad, and sweet tea on every menu. We had to get our fill of it because on the houseboat, we would be eating my cooking. I’m a good cook but I have my limits. Plus, deep-frying on a boat seems terribly wrong. Sand on the floor, surfboards on the ceiling, gator on the menu, and live reggae. The St. John’s River is in Florida, north of Orlando. We couldn’t resist the allure of the local attractions and spent our first day at Kennedy Space Center. I was a kid during all that early space tomfoolery and wanted to be an astronaut until the Beatles came along and I decided to become a drummer. So we overcame a bit of jet lag and got used to the roasting sun looking at space junk. Competing with nearby attractions meant waiting in a few lines surrounded by a short loop sound track that reminded me of Jurassic Park background music. I found myself expecting to see T-Rex peeking around a booster rocket, or maybe I got a bit too much sun. Boosters or thrusters or something, very big. The original space capsule, very inviting. Spacesuit Maintenance Kit, Apollo 13, April 11-17, 1970, very scary. We checked into the marina, unloaded our steamer trunks, and headed out to our last gourmet meal. One dollar draft beer has got to be good! We cleared the Winn-Dixie grocery shelves of anything edible, crammed all of it into our rental car, made a quick stop at the liquor store (beer, rum, and Southern Comfort) and made it back to the marina with a minimum of wrong turns. At Winn-Dixie they have pickled sausages and pickled eggs. We had our orientation cruise in the morning and then we were free! With an empty week ahead of us, we decided to first tackle the areas that would attract weekend crowds, and seek solitude for our final days. Captain Bartender at the wheel of Dolphin,our home sweet home for a whole week! Silver Springs Glen is only 30 miles downriver (North) from the marina and easy mooring if you can find a couple trees to tie off to. We spent the morning reading the Cruising Guide and Houseboat Handbook, spotting channel markers, and learning to steer our giant shoebox with its teeny tiny propeller. Captain Bartender, modeling a kitty litter t-shirt I brought him from the 2016 BlogPaws Conference in Phoenix. By noon we were exhausted, so we dropped anchor and ate lunch. Seeing boats veer around our bulk and watching the shore slowly drift by . . . WAIT! I brought two koi windsocks for navigational aids. Eternally optimistic, I also brought a hummingbird feeder. Maybe not so anchored, and by the time Captain B. (son of a mighty lumberjack) hauled that bad boy aboard we were somewhat suspicious of the anchor, the theory and practice of anchoring, and the false security that a toy anchor provides. LESSON 1: Never trust your anchor. On the road river again. Most of the time we were the only boat on the river, but it’s a biga$$ river. During the week, we covered almost a hundred miles in our floating home. Manatee signs were everywhere, but they are hard to spot in the shallow murky water. We looked anyway, so we could be sure to slow down if we saw any, slow down from barely drifting, that is. I’ll admit it, one reason we were so excited to steam north was a Lake George notation in the Cruising Guide and Houseboat Handbook: AIR FORCE PRACTICE BOMBING RANGE. The Bartender and I are enjoying our sunset years, and possibly because of this, we are okay with taking some risks. Lake George is huge, the second largest lake in Florida, and averages only an embarrassing 8 feet deep. The channel markers to Silver Springs Glen run directly adjacent to the west edge of the U.S. Military bombing and aerial mining range. I should let you in on a secret: The Bartender is a retired Navy Captain. Although he gets seasick walking down the dock, he has a fearless and professional marine radio presence, so I knew we would be perfectly safe. Anyway, crossing Lake George should be a cakewalk. LESSON 2: When shopping for supplies, don’t forget to buy dessert. Sheesh, a package of Oreos, at least! Page 12 in the Cruising Guide, if you’re following along. Which I highly recommend, by the way. When you leave the St. John’s River channel for Lake George, you are in for a little shock. The Cruising Guide and Houseboat Handbook instructs you to go between the fences. However, from the river, no “between” is apparent, surely it’s a long single fence. As you continue, the immensity of Lake George looms, and just when you think you have gone too far and are now entering the Atlantic Ocean, a peekaboo gap opens in the fence, and the “between” is revealed. The moment you exit the fences, the invisible bombing range is to your right, your east, starboard ->. The first channel marker is visible ahead, and everyone smiles. Piece of cake! LESSON 3: The channel markers on the Cruising Guide and Houseboat Handbook maps are not accurately drafted. I’d like to report that we were bombed, taken as hostages, escaped, made it to Cuba, received a Medal of Honor. But it was just a stressful joint operation with Captain Bartender swerving from marker to marker, tersely reporting “depths” or more descriptive and noteworthy “shallows.” Eyes darting to the east bombing range, commanding another channel marker to appear where the map indicated a plausible location for one. I watched as the clouds gathered, the chop increased, and my boat binoculars (missing an eyepiece from whale watching in Maui) failed to validate the accuracy of the Cruising Guide and Houseboat Handbook map. Lesson 4: Do not cross Lake George in rough weather. Finally, the mythical channel markers appeared, we adjusted our course to 270° and searched in vain for the entry to the springs. Seventeen hours later, some evenly spaced and perfectly matched crab pot buoys appeared both sides of the motor home and the entrance to Silver Springs Glen magically appeared. The parking lot at Silver Springs Glen. The folks at the right side of the photo are standing in the waist-deep water. If you look real hard, you can see the red and green channel markers, left side of photo. It was magic because the chop stopped, the clouds cleared, the area became idyllically calm, the water clear and clean, and the tree-anchors were available in abundance. Moored to a tree. That’s how the ants come aboard. Captain Bartender agonized over our parking, made certain we were out of the channel, secured us perfectly and legally to the trees. (Keerunch is the sound the branches make as they yield to our upper deck/canopy.) Welcome to happy hour! The red channel markers are the outer edge of the channel. The inner edge, the green markers, probably line up with that middle window. The kid on the roof deck is about mid-channel. We sat with cocktails and watched another Holly Bluff Marina houseboat- the gigantic family-sized model with the water slide off the stern- moor just east of us, completely blocking the channel, forcing all other boats to veer into shallow water where the smaller boats were anchored. Welcome to Florida! It was the kiss of death to call this part one, so if you don’t see part two pretty soon, will someone please remind me? I want to tell you about the wildlife we saw, and I think I have some videos, too.